The first thing people think of when they hear the word chowder is probably clam chowder, which is a wonderful thing, but clams are not the easiest things to deal with and I don't know anyone who just happens to have clams. Potatoes, on the other hand, are a different story, as well as the rest of the ingredients for this hearty potato chowder. 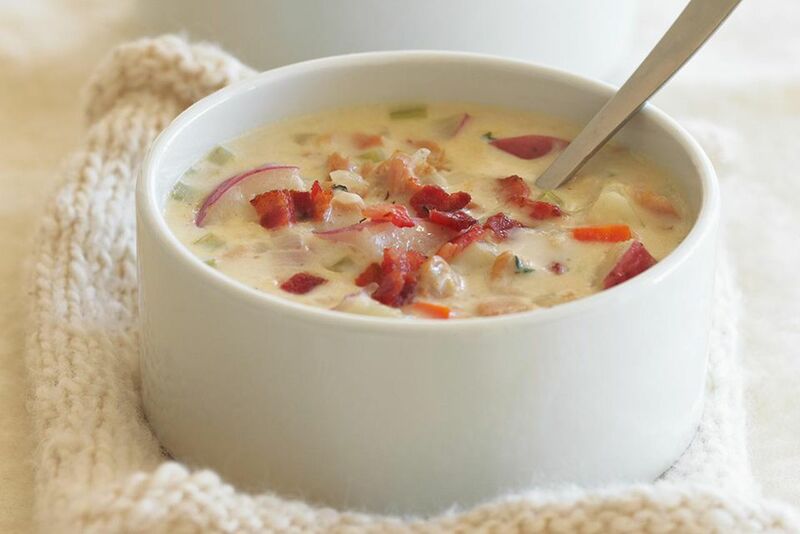 And that's fortunate, because the word "chowder" refers to any cream-based soup thickened with flour, and featuring potatoes and salt pork or bacon. You can make clam chowder, fish chowder, corn chowder, etcetera etcetera. But each of those soups at its base is a potato chowder. Master this and you'll be three-fourths of the way to making your own seafood chowder. Not that you have to. A simple potato chowder is exceedingly satisfying, and needs no seafood or shellfish to justify its existence. This one is made with red potatoes, which is nice for the color (since we don't peel them), although almost any firm, waxy potato, like whites or Yukon golds, will also work. The bacon adds a salty, smoky flavor that is woefully absent from just about any canned chowder in the world, but which to me is a necessary and fundamental element. Add the pork or bacon to a heavy-bottomed saucepot or soup pot, and heat it slowly over a low heat, stirring more or less constantly, for 3-4 minutes or until the fat is liquefied. Be careful not to let the fat burn. Lower the heat if it starts to smoke. Add the flour and stir with a wooden spoon while it's absorbed into the bacon fat, making a roux. Cook the roux for another 3-4 minutes, but like the onions, don't let it brown. Add the potatoes and simmer 15 minutes or so, or until you can easily pierce the potatoes with a knife. You should see an occasional slow, gentle steam bubble, but not the rapid bubbling of a full boil. Add the hot half and half and bring the chowder back to a simmer for just a moment. Season to taste with Kosher salt and white pepper, garnish with chopped parsley and serve right away. Want To Make Your Own Authentic New England Clam Chowder At Home?